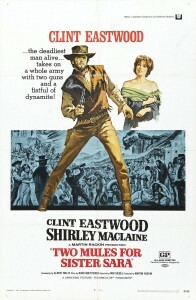 This one stars Clint Eastwood and Shirley MacLaine. It’s directed by Don Siegel, from a story by Budd Boetticher, with music by Ennio Morricone. All of that sounds great, right? Somehow this is less than the sum of its parts. Clint Eastwood has cited Don Siegel (director of Dirty Harry and The Shootist) as one of his two greatest directorial influences, along with Sergio Leone; he dedicated his last western, Unforgiven, to them. This features Clint in his early 1970s leather hat period (albeit the hat appears to be basically of the same design as he wears in the Dollars trilogy and Pale Rider; leather would be hotter than felt, though). He is Hogan, a Civil War veteran and mercenary working for the Juaristas battling occupying French soldiers in northern Mexico in the 1860s. 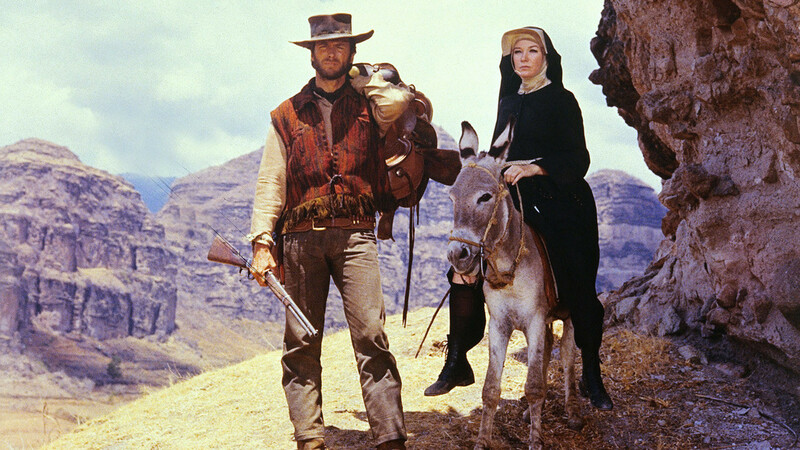 In the movie’s opening scenes, he rescues an unclad Shirley MacLaine from three very unsavory American bandidos. When she dresses, he’s surprised to find she’s a nun—Sister Sara. She’s also working for the Juaristas, it turns out. Hogan has agreed to help Col. Beltran (Manuel Fabregas) take the French garrison in Chihuahua in exchange for half the treasury. Sister Sara knows the garrison well, having taught the French soldiers Spanish there before they discovered she was working for the Juaristas. Together they devise a plan for attacking the garrison with Juarista support, so Hogan can collect his treasury, Sara can help the Juaristas, and Col. Beltran can root out the French from his country. On their way to Chihuahua, Hogan is shot with a Yaqui arrow and Sara has to help him blow up a railroad trestle with a train full of French troops going to reinforce Chihuahua. Arriving in Chihuahua, Sara leads them to a house with a tunnel going into the garrison—a house of ill repute, as matters develop. Sara is a resident of the place who has disguised herself as a nun to escape French retribution. They storm the garrison, Hogan gets his treasury, and in the end Hogan and Sara ride off together, this time with Sara in a more suitable bright scarlet. It’s unclear what the two mules of the title refer to. The pairing of a profane adventurer with a woman of God echoes The African Queen. In fact, MacLaine was said to get along with neither Eastwood nor director Siegel. As with many films from the early 1970s, much of the blood looks like red paint. Watchable, but the script has some clunky dialogue and the story doesn’t hang together real well. Some have suggested it would work better if Sara stayed a nun. 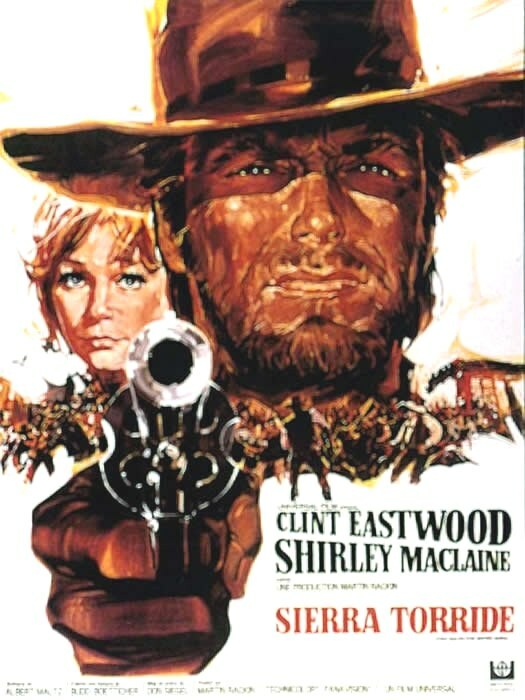 Story by Budd Boetticher, music by Ennio Morricone. In color, filmed in Mexico. This entry was posted in Westerns Worth Watching and tagged Adventures in Mexico, Budd Boetticher, Clint Eastwood, Don Siegel on November 27, 2013 by Nicholas Chennault. 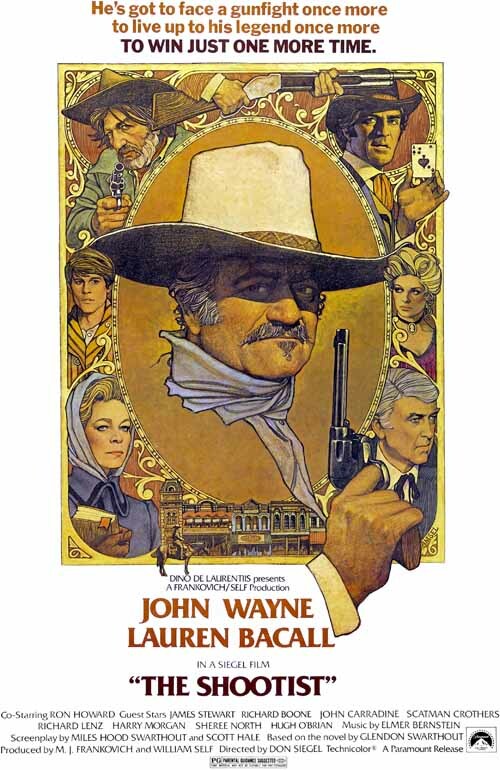 The Richard Amsel poster for The Shootist is typical for the 1970s and 1980s. An elegiac end-of-an-era western, as the titular shootist, gunfighter John Bernard Books (John Wayne), literally and figuratively comes to the end of his road with considerable dignity. This is also a coming of age story for Gillom Rogers, well played by the young Ron Howard. And it was the last movie in the remarkable career of John Wayne, then 68 and dying of terminal stomach cancer. The movie opens with an effective montage of shots from earlier Wayne movies, from Red River to Hondo to Rio Bravo to El Dorado, as Books supposedly ages, with a voiceover by Ron Howard. 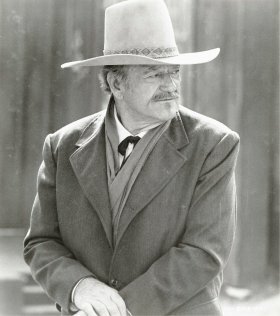 The Books credo sounds persuasive, coming from a character with the physical and historical heft of John Wayne: “I won’t be wronged, I won’t be insulted, and I won’t be laid a hand on. I don’t do these things to other people, and I require the same from them.” In 1901 Books is heading to Carson City, Nevada, where all the action in the movie takes place. The Old West is passing, and so is Books himself. J.B. Books (John Wayne) arrives in Carson City at the turn of the century. Books is in fact dying of cancer and is looking to live out whatever time is left to him with as much dignity as he can muster. How he goes about this makes up the remainder of the movie. It moves more slowly than most John Wayne westerns, but we’re happy enough to see him on the screen that it doesn’t drag and it never becomes unduly sentimental. Howard is good as a fatherless, sometimes mouthy, teenager looking for role models. The movie has some excellent actors in cameos and character roles: James Stewart as a doctor, Lauren Bacall as the widowed operator of a boarding house and mother of the young Howard, Harry Morgan as an obnoxious marshal, and the funereal John Carradine appropriately cast as an undertaker. You sense that there could have been a relationship between Books and the Bacall character if only Books had more time left to him, although if she’d known who he was she wouldn’t have let him stay at her boarding house in the first place. 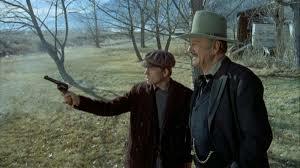 Books (John Wayne) teaches Gillom (Ron Howard) to shoot, but also and more importantly, about becoming a man. And then there are the villains, played by Hugh O’Brien, Richard Boone and Bill McKinney. One gets the feeling that none of them had enough dramatic weight to balance the Books character, so there were three. They still don’t balance with Books. Richard Boone is always good to watch, but this isn’t his best role, and he seems more curmudgeonly than downright bad. He deserved a better-written character with more lines and personality, and perhaps a touch of his traditional villainous courtliness. This was one of the last movies for both Boone and Stewart as well as for Wayne. A generation of actors was passing. In his final shootout, Books (John Wayne) takes on three separate bad guys at once. As in The Cowboys, the John Wayne character doesn’t come out of this alive. But he wasn’t going to, given the setup of the movie, and it’s a pleasure to watch the grace with which he accomplishes it. It’s hard to imagine anyone else in the role, but it’s said that the producer approached Paul Newman and George C. Scott first. At the time there was no certainty that it would be Wayne’s last picture, but it was a strong way to go out. Don Siegel directed a couple of westerns, but he was known more for his work with Clint Eastwood in Dirty Harry and Escape from Alcatraz. The music is by Elmer Bernstein, a long-time master of the traditional movie score, including many westerns. This was based on a decent novel of the same title by Glendon Swarthout. It was the Bicentennial summer, and this was one of two great westerns released. The other was The Outlaw Josey Wales, and they both remain highly watchable. This entry was posted in 55 Greatest Westerns and tagged Aging Gunfighter, Coming of Age Stories, Don Siegel, End of an Era, Frontier Doctors, John Wayne, Richard Boone on August 20, 2013 by Nicholas Chennault.